Lewis Sperry Chafer was born February 27, 1871, at Rock Creek, Ohio. Graduating from Oberlin College in 1892, he studied under Dr. Frank E. Finch and was ordained to the Presbyterian ministry in 1900. Chafer launched into evangelism, demonstrating talent as a Gospel singer as well as a preacher. He toured as a renowned Bible lecturer from 1914 until 1924, when he founded Dallas Theological Seminary and became its first president. Chafer was widely honored, receiving a D.D. from Wheaton (1926); Litt.D. from Dallas (1924); and Th.D. from the Aix-En-Province, France, Protestant Seminary (1946). He wrote prolifically, producing his widely read Grace, Salvation, and True Evangelism; and his monumental Systematic Theology. Through all the acclaim and accomplishments, his students remember best his deep reverence for the Word, and a daily, humble dependence on the Holy Spirit. 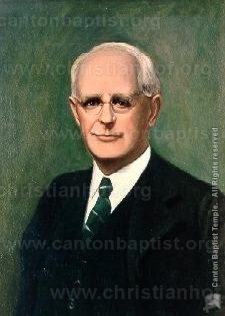 Dr. Chafer died August 22, 1952, but his word continues through his books and his students.